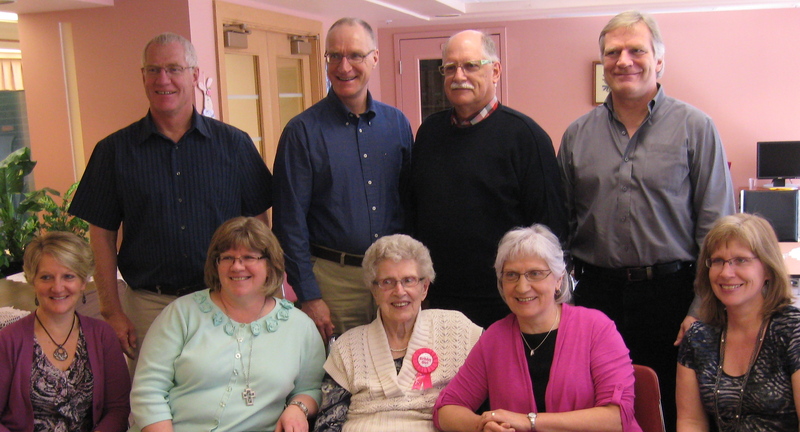 My mother turned 90 yesterday, and my seven siblings with spouses, as well as several granddaughters and great-granddaughters, travelled to Winnipeg to mark the milestone. Mom was born in the former USSR, in today’s Ukraine, in 1922, and fled Russia with her parents as a small child. She grew up on a farm near Winkler, Man. She enjoyed school. Her father was somewhat unusual in the Mennonite community of the time in that he insisted his five daughters get an education and profession. Three of them chose nursing, and two, including Mom, chose teaching. Mom left her teaching career when she married, but her teaching gifts continued to be exercised in various ways, not least of all as mother of eight children. Her interests were always bigger than the domestic. My older brother recalls how CBC news was a mainstay of Mom’s day, which in turn influenced his own ongoing interest in global affairs. Mom initiated and organized a girls’ club program in Linden, Alberta, where we lived for many years, as well as leading church women’s groups. When my parents lived in Carman, Man., where Dad pastored, she did various kinds of small group teaching and was instrumental in starting the MCC Thrift Store in that community. On Friday morning, two of my younger sisters took Mom to Carman on something of a nostalgia tour (for the sisters as much as Mom, I think) and stopped at the thrift store, which is still doing well. They bought Mom a pretty vest, which she wore for the come-and-go party we held in her honor yesterday. At the end of his tribute and presentation of a family photo book on Saturday evening, my second brother invited us, sitting in a circle in our basement TV room, to stand up and do literally what it says about the “worthy woman” in Proverbs 31: “Her children rise up and call her blessed.” We did so gladly. We feel fortunate to have had a mother like her. 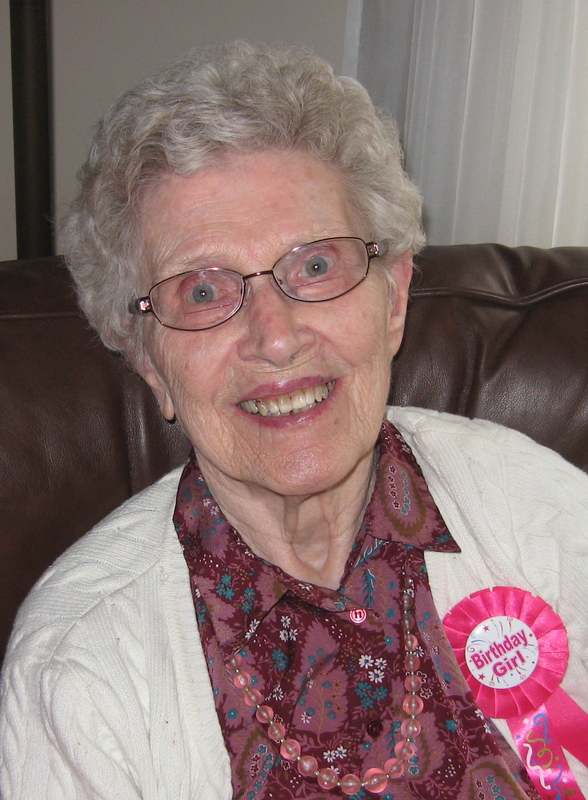 At 90, Mom is frail and has limited mobility, but in spite of some mild dementia, she is still fairly alert. That same evening, at about the hour we used to have to go to bed so my parents’ adult conversation could begin, it was Mom who was tired and had to go to bed, back in her room at the personal care home. The rest of us stayed together after that to reminisce. (With a mother her age, of course, we’re not exactly new to the world ourselves.) It was a wonderful time, jumping from one incident to the next, everyone supplying details to augment the others’ stories. It’s been a long while since I’ve laughed as much. Even though it was an achievement of 90 years that brought us together, the act of celebration allowed us, for a few hours at least, to play with time, to turn it inside out and round and round. Via memory, Mom was young and Dad was alive, and we were still just a bunch of crazy kids. This entry was posted in Family, Personal and tagged 90, Tina Doerksen by doradueck. Bookmark the permalink. “… Mom was young and Dad was alive, and we were still just a bunch of crazy kids.” Love this, Dora! When did your parents live in Carman, Man? I grew up going to the farm and the fair most summers in Carman. My Grandma always supported MCC Thrift Store. Fascinating connection! They lived in Carman about 1973-83. I had left home by then. The MCC Thrift stores are celebrating their 40th anniversary; first shop opened in Altona in 1972. Apparently last year they took in some $ 5 million in sales in Manitoba alone! WOW $5 million just from Manitoba? It’s amazing! My grandparents moved to Winkler in 73-74 if I remember right. Interesting history. Our family had eight children as well, but we were five girls and three boys. Mom didn’t make it to 90 (she died in 2008), but dad was in his 93rd year when he died in 2005. Are you the oldest daughter? I’m oldest daughter, yes. I have an older brother, then three brothers follow, and I finally got my sisters at the end of the line. Congratualations on your mum’s 90th Birthday, Dora. And thanks for sharing your stories, I enjoy them very much! My mother is now 85. Just did some “facetime” with her using iPhone and iPad at my sister’s house. If my mother had gone to college, she would have been a lot like your mother, I think. As it was, she found some very creative ways to use her gifts as reader, writer, and speaker. Like you, I owe much to my mother. Thanks for this lovely story. When large families get together at this stage of life, anything can happen. What a wonderful tribute to your mom, both the writing and getting together as a family. Of course, my favorite – the photo! Thanks — to someone who knows plenty about the children we once were!